Richard Rojas, 26, was ordered held without bail at his arraignment Friday. MANHATTAN CRIMINAL COURT — The Navy veteran who fatally mowed down an 18-year-old tourist and injured 21 others on a Times Square sidewalk was on a premeditated mission to kill and be killed by police, authorities said Friday. Richard Rojas, 26, left his Bronx home around 10:30 am. and got Manhattan about 30 minutes later. He was driving south on Seventh Avenue when he made a sharp U-turn onto Broadway at 42nd Street and mounted the curb just after 11:50 a.m. He continued to plow through crowds along the sidewalk until he slammed against a metal stanchion at West 45th Street, the NYPD said. "You see him on the left lane on Seventh Avenue," Manhattan South Chief of Detectives William Aubry said Friday. "As he approached 42nd Street, he slows down. He allows traffic to pass, then he makes that right turn onto the sidewalk. He accelerates while he's doing so. While he accelerates, he starts to strike down the first pedestrians." "People are being dragged. They're on top of the car," Aubry added. Alyssa Elsman, of Portage, Mich., died at the scene, while her 13-year-old sister, Ava, is being treated at Cornell Hospital for a collapsed lung and broken pelvis, the chief said. A 38-year-old woman, who was visiting from Canada, is also in "very critical condition," according to police. 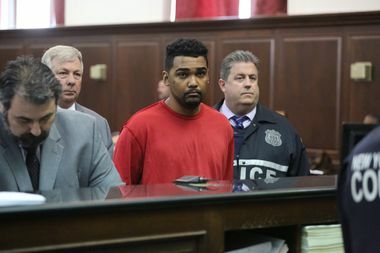 "He murdered — in cold blood — an 18-year-old woman, severely injured her 13-year-old sister, who were here in New York City on holiday," Assistant District Attorney Harrison Schweiloch said at Rojas' arraignment Friday. "He continued his carnage and only stopped blocks away." "He exited his vehicle and proclaimed he wanted to kill them all and that police should've shot him to stop him," Schweiloch added. Rojas later told police that he had smoked marijuana laced with PCP, according to the Manhattan District Attorney's Office. He was charged with murder, vehicular homicide and 20 counts of attempted murder in connection with the attack. Rojas said nothing during his arraignment in Manhattan Criminal Court Friday. He was ordered held without bail and is due back May 24. The Times Square carnage wasn't his only brush with the law. He enlisted in the Navy in 2011, eventually leaving the military under a cloud in 2014, never having served overseas, according to records. Last week, he was arrested for pulling a knife on a 45-year-old stranger and asking him, “Do you feel safe?” according to police. He was also arrested for drunk driving in Queens in 2008 and in Manhattan in 2015. Mayor Bill de Blasio told WNYC's Brian Lehrer during a weekly radio address Friday that Rojas' mental issues “went unaddressed when he was in the U.S. military." His lawyer, Enrico DeMarco, declined comment after the arraignment.